This bentwood accent table provides a convenient solution for placing snacks or drinks while sitting on your sofa. A circular white base and stand offer sturdy support, while a tempered glass top has plenty of surface space for putting a cup of tea, bag of tea, bag of popcorn, or bowl of ice cream. Its structure is also curved gently forward. Functional and stylish, this piece is a must-have for any living room. This bentwood accent table provides a convenient solution for placing snacks or drinks while sitting on your sofa. A circular white base and stand offer sturdy support, while a tempered glass top has plenty of surface space for putting a cup of tea, bag of popcorn, or bowl of ice cream. Its structure is also curved gently forward. Functional and stylish, this piece is a must-have for any living room. Welcome this elegant accent table in a fresh white finish that is both stylish and multi-functional into your home. Featuring a two tiered design in tempered glass to display either your favorite decorative pieces or a plant, along with pretty side scrolls design in metal will brighten any room and space. A perfectly tapered accent table that fits independently with any furniture in your home, this rectangular table features a frosted tempered glass surface perfect for you snacks, drinks, meals or tablet. The white metal base easily slips under a sofa or chair and provides sturdy support along with a fashionable touch that will suit any decor. A multi functional accent piece ideal for a living room, family room, den, home office. This elegant accent table is both stylish and multi-functional. Featuring a two tiered design to display your favorite decorative pieces and with fashionable scroll inspired accents this table is one of a kind. With tempered glass surfaces and a fresh white finish, this piece that will surely make a statement in your home. 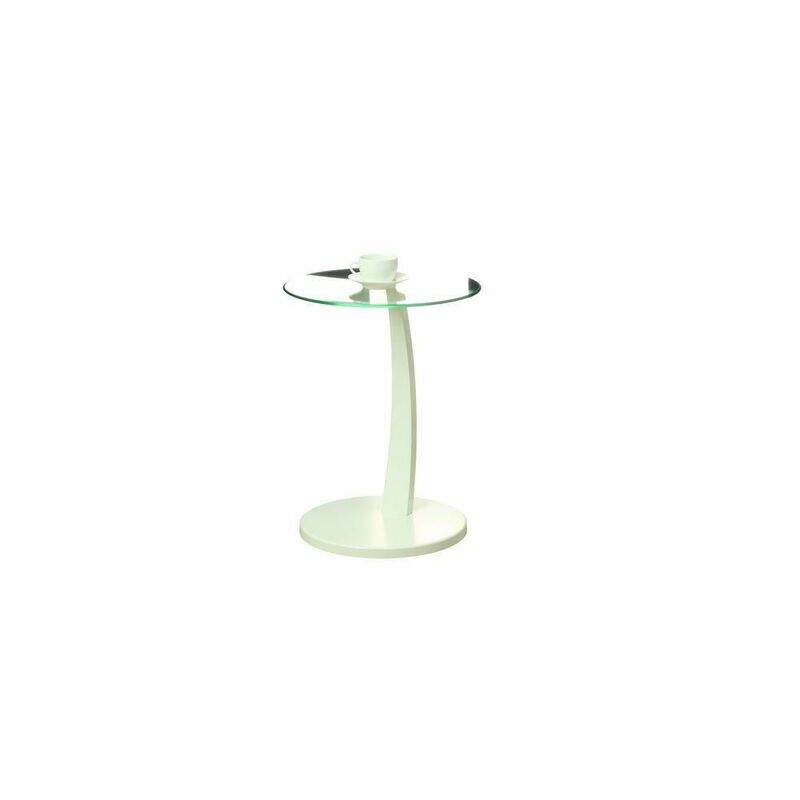 Accent Table - White Bentwood With Tempered Glass This bentwood accent table provides a convenient solution for placing snacks or drinks while sitting on your sofa. A circular white base and stand offer sturdy support, while a tempered glass top has plenty of surface space for putting a cup of tea, bag of tea, bag of popcorn, or bowl of ice cream. Its structure is also curved gently forward. Functional and stylish, this piece is a must-have for any living room. Accent Table - White Bentwood With Tempered Glass is rated 3.0 out of 5 by 2. Rated 2 out of 5 by SJP from Looks good after we had to purchase the wood plugs... Looks good after we had to purchase the wood plugs and have them painted white to match since they are no longer included. After a call to the manufacturer we were told they were deemed unnecessary. So untrue unless this table is set up against a wall, which ours is not. We would NOT recommend.